I warn you, this will probably be way more information than you ever wanted to know about this! 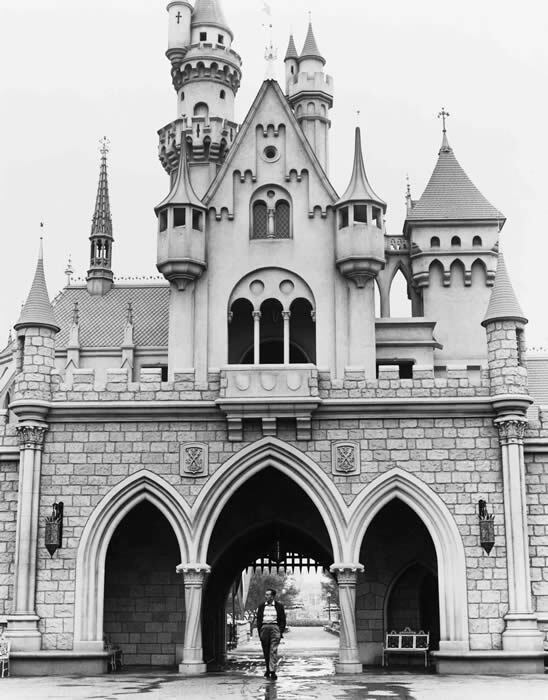 For years, Disneyland fans worldwide have probably seen the mysterious brass spike (some call it the golden spike) in the ground just as you exit Sleeping Beauty Castle while walking into Fantasyland. 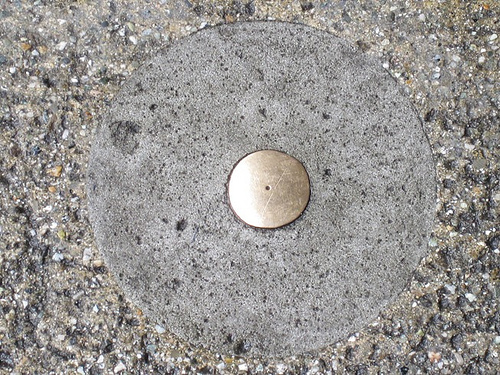 Undoubtedly, many people have asked castmembers, tour guides and online Disney freaks what it is and more often than not, the answer always turns up to be that it was originally installed there to mark the “geographic center of the park” when Disneyland was being built. This myth has travelled so far as to reach the pages of many Disneyland-related books. 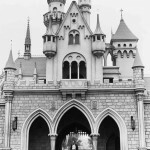 The most recent one I’ve found was Little Known Facts About Well Known Places – Disneyland by David Hoffman. 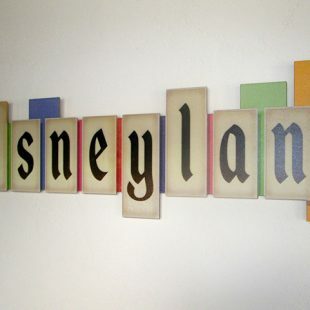 Many people relish in the idea that this is one of those little known Disney items that may have been directly associated with Walt Disney himself—a very compelling piece of Disney lore that can only be found at Disneyland in Anaheim. 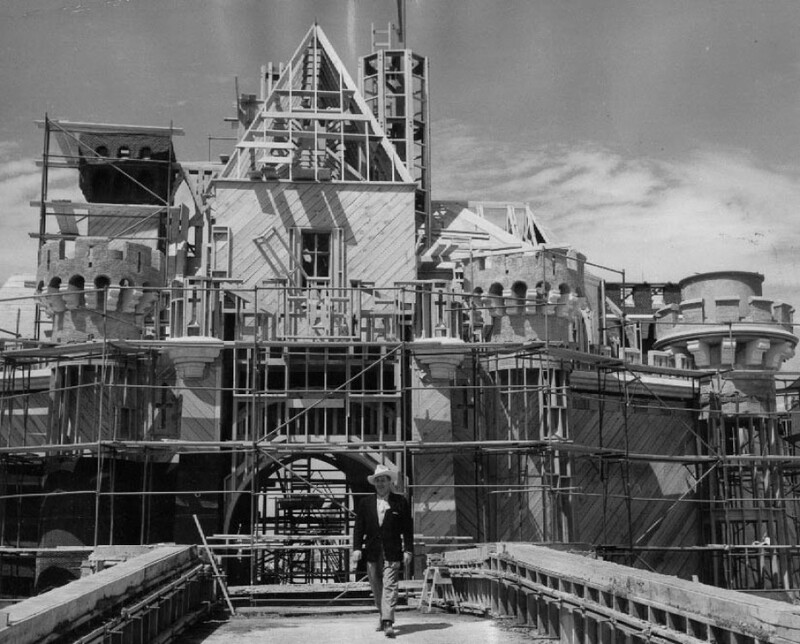 Even the fact that it appears to have been left alone when they changed the type of cement in Fantasyland back in the 1983 renovation adds to this mystique. Regardless of why this spike is here, I can tell you one thing for sure…it does NOT mark the center of the park and it never has! 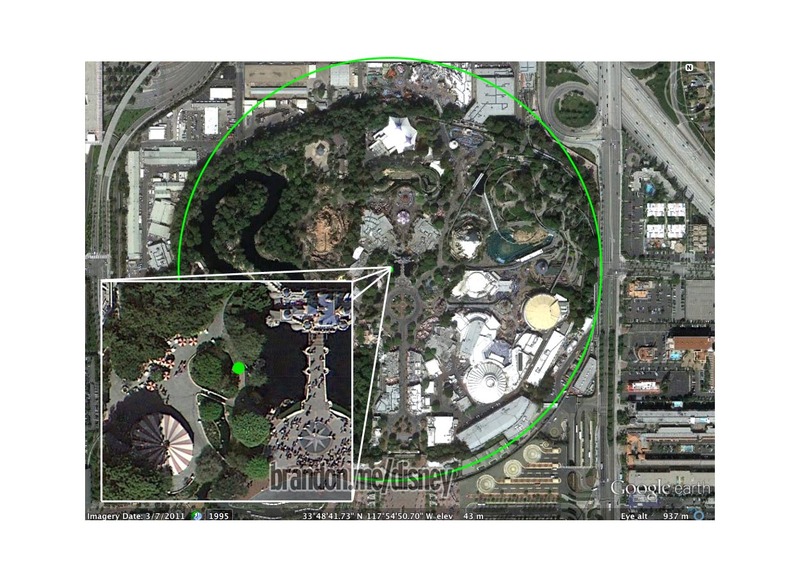 One look at an aerial photograph of Disneyland will show you that this spike could not be the center of the park. But does it mark the center of anything? Let’s take a look. I have taken the liberty of drawing out perfectly round circles all stemming from the “center” of the park as supposedly denoted by this brass spike behind the castle. As you can see, through all four major configurations of Disneyland’s borders, none of them impart that the brass spike marks the true center. 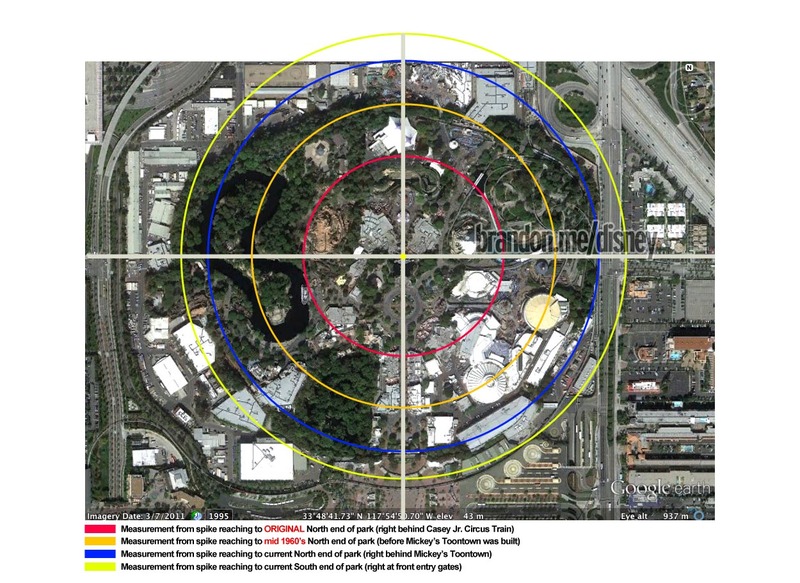 The only one that comes close to this claim is the blue circle, which can only happen if you measure from the back of Mickey’s Toontown to the Main Street Train Station. However, this measurement comes up short because it doesn’t take into account the west side of the park, which even though it’s changed much in the last 57 years, was present in 1955. 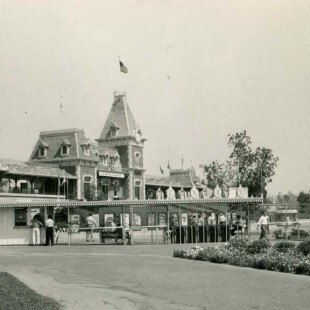 Since Disneyland was not circular in design back in 1955 as it somewhat is today, the original center of the park was in the lower left corner of the central hub (where the Partners statue is today). As shown below, the true center of the park today is actually just off to the left and south of the castle face. Conveniently, it sits on a little pathway to the right of the Carnation Plaza. 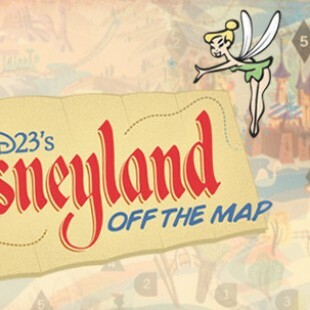 So the next time you’re in Disneyland, feel free to head on over to this location and tell your friends that you’re standing in the true center of the park and anyone who says otherwise has no idea what they’re talking about! This little study should finally put to rest at least one myth of Disneyland. To make sure all the bases were covered, my “true center” includes all of the Rivers of America, all of Mickey’s Toontown and finally, reaches down to the main entry gates. I’m aware that the green circle exceeds these boundaries by a little bit, but because they do so on all borders equally, the center still remains the same. So after all this, what is it?? According to a few people out there, it’s one of two things. 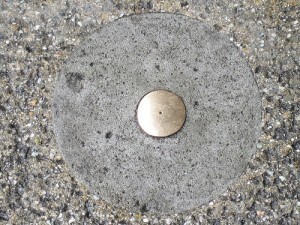 Either it’s to mark the location of the famous photo of Walt Disney walking through the castle or it’s a simple surveyor’s mark used to help align Main Street to the castle. I tend to think it’s the latter considering Walt appears to be further away from its location in the photo. Aren’t you glad you now know this information?! It’s my understanding that it marks the center line of Main Street. Yes, that was my conclusion as well. 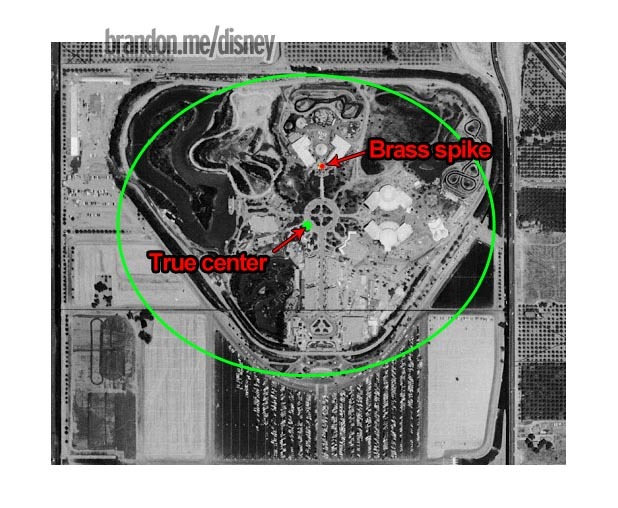 Trackback: Disneyland Central Gold Spike: Fact or Fiction? Don’t these exist all over the place for map makers and the geological survey society? I see them marked on topo maps.